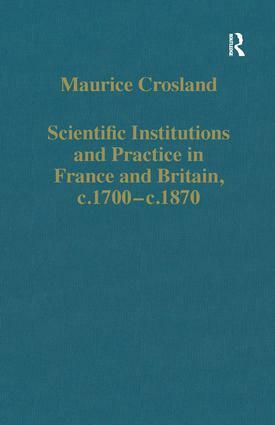 This second collection of studies by Maurice Crosland has as a first theme the differences in the style and organisation of scientific activity in Britain and France in the 18th and early 19th centuries. Science was more closely controlled in France, notably by the Paris Academy of Sciences, and the work of provincial amateurs much less prominent than in Britain. The most dramatic change in any branch of science during this period was in chemistry, largely through the work of Lavoisier and his colleagues, the focus of several articles here, and the dominance of this group caused considerable resentment outside France, not least by Joseph Priestley. The issue of authority in science emerges again, within France under the rule of Napoleon, in a study of the exceptional power exercised by the great mathematician Laplace both in theoretical science and in academic politics. This exploration of organisation and power is complemented by a comparative study of the practice of early 'physics' and chemistry and their different reliance on laboratories. This raises the question of whether chemistry provided a model for later experimental work in other sciences, both through the construction of pioneering laboratories and in establishing early schools of research. Contents: Preface; Supplementary bibliography. Part I Institutions: Relationships between the Royal Society and the Académie des Sciences in the late 18th century; The Copley Medal: the establishment of a reward system in the Royal Society, 1731-1839; The officiers de santé of the French Revolution: a case study in the changing language of medicine; Lavoisier, the 2 French Revolutions and the 'imperial despotism of oxygen'; A science empire in Napoleonic France;The organisation of chemistry in 19th-century France; Popular science and the arts: challenges to cultural authority in France under the Second Empire. Part II Practice: Early laboratories c.1600-c.1800 and the location of experimental science;'Slippery substances': some practical and conceptual problems in the understanding of gases in the pre-Lavoisier era; Chemistry: 18th century; Research schools of chemistry from Lavoisier to Wurtz; Difficult beginnings in experimental science at Oxford: the Gothic chemistry laboratory; Index. Maurice Crosland is Emeritus Professor in the School of History, University of Kent at Canterbury, UK.